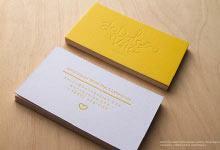 This sophisticated business card template of gold metallic ink on white textured cardstock is an exquisite and attractive way to portray your business. The paper has a pulp-like quality and weighs 30pt making it perfect for the debossing technique used. The metallic ink is a high-quality printing technique which adds a glamorous semi-reflective sheen. Another feature is a full bleed design which means that the debossing area of this template comes within 0.25” of the edge of the card. This allows for more space to be used in the design and gives a more refined finishing. Die-cut corners finish the trimming of this beautiful visiting card. The Greatlife Luxury Spa Centre Template is excellent for exclusive companies like luxury spas or boutiques. Naturally sophisticated, these card’s pulp-like quality and textured surface will effortlessly coincide with any minimal card design. We offer up to three spot colours on each side of this card stock (please note spot colours are not a 100% true match, it is as close as possible). Weighing at 30pt, this card stock is also great for embossing, debossing, and letterpress. Foil stamping is also available. What this card stock is not suitable for: full bleed designs, gradients, and the use of several colours. 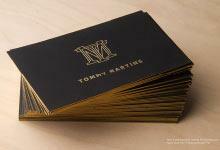 Oversized Plates My foil stamp, letterpress, thermography, emboss or deboss design go beyond the safe margin.